Better known for their top of the range Double Edge Safety Razors and Cut Throat Razors, Feather also produce a two blade cartridge razor the F11 Neo. The F11 Neo Razor comes with two cartridge blades. We advocate safety razors for a close and comfortable shave but we appreciate that for some guys a safety razor may not suit their skin type. Teenage boys with acne and those who have ultra sensitive skin will also benefit from using a two blade cartridge razor. 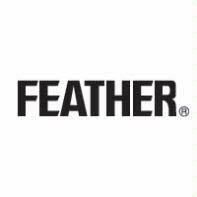 Women also benefit from using a Feather Neo especially around the bikini area as the shave is so gentle for delicate skin. The head will swivel and change its cutting angle matching the contours of your face. The head can also be locked in place which is ideal for cutting sideburns nice and square. Unlike Gillette, Wilkinson Sword and supermarket blades, Feather blades are very sharp meaning you need less passes to get a close shave and less passes = less irritation. Changing blades is easy and quick. This two blade razor is better than other multi blade cartridges with three and more blades, the less metal on the face the less irritation you'll get. Ensure you are using a clean, sharp cartridge blade. After applying a pre shave treatment and your shaving soap, cream or gel to your face, dip the razor into warm water and begin to shave. We recommend that you shave twice with the grain and once against the grain. Be sure to regularly rinse the blade in warm water between passes. Why Buy A Feather F11 Neo? Well for a start, this is a very good price for a Japanese made razor that comes with three blades, a holder and a shaving foam. Additionally, Feather make very high quality razors and the Neo is no exception. We recommend you also buy a RazorPit Razor Blade Sharpener, this handy, easy to use sharpener will extend the life of the blade giving you up to 150 shaves from one blade! Click here for more information.